As a kind of Ethernet network switch, the managed switch is now widely used for home network. Therefore, choosing a well-performing managed switch for home is a significant task. Well, how do you choose a managed switch for home? Here will have a thorough introduction to the managed Gigabit switch, its benefits and how to choose it. Fully managed switches are usually employed in large enterprise or complex data center, offering all capabilities of the managed switch. When users want low cost and do not need so many features of the managed switch, the smart managed switch is an optimal choice. It has a limited number of options for configuration and is ideal for home or office use. As shown in the figure below, FS S3900-24T4S fanless switch has an advanced feature set that brings robust multicast control, high availability, security and simple management. It is also a stack switch and is easy to be employed in the home, SMB and schools with a cheap price. 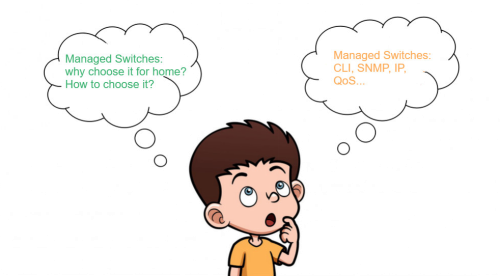 Why Choose the Managed Switch for Home? Conventionally, the unmanaged switch is used for home. However, as a plug & play switch, it has limited performance and doesn’t support any configuration interface or options. With more requirements of home users, the managed switch gets more popular for home. There are three main advantages of choosing the managed switch for home network. Security and resilience - Managed switches deliver the most precise control of data, bandwidth and traffic control. And additional firewall rules can be set up into it directly. Therefore, the managed switch can provide good protection of the data plane, control plane, and management plane. Redundancy - Redundancy means a back up data path to network traffic to safeguard the network when a connection or cable fails. The managed switch can incorporate Spanning Tree Protocol (STP) to provide path redundancy in the Ethernet network. And this also prevents loops which are created by multiple active paths between switches. Prioritize bandwidth for data subsets - The managed switch can prioritize one type of traffic over another. This enables more bandwidth to be contributed through the network. Therefore, this function brings higher network performance and better transmission of delay-sensitive data. When choosing a managed switch for home in the market, you’ll find there are many options. Here is a guide for you. Features and performance - As mentioned above, the managed switch has many features. There is no need for you to select a managed switch with all features for home. Except for the basic features such as advanced QoS, VLAN, security, etc, you’d better take switching capacity, max power consumption, continuous availability into consideration. Beside, fanless and stack designs are important factors as well. Fanless design help reduce the power consumption and stack design can save the place makes. Switch ports - The managed switch often comes with copper or optical ports, PoE or PoE+ ports, and a console port. Usually, there are three types of ports on a managed switch. The copper port can connect with Cat5e or Cat6. Compared with the copper port switch, the switch with optical port connects with fiber transceivers and optic cables to uplink to the backbone switch for longer transmission. PoE or PoE+ ports are designed for home IP camera systems, or for situations where there is no power source for PoE enabled devices. The count of the main ports often come with 8, 24 or 48. Besides, the 8-port and 24-port managed switches are commonly used for home. You can choose a suitable one based on your need. Costs - The cost of copper port switch is lower than that of the optical port switch. What’s more, devices connected with copper port like Cat5e or Cat6 are cheaper than the device needed by the optical port including transceiver and fiber patch cable. When you already have determined the type of managed switch you want, you can compare the price from different companies. Usually, managed switches from famous brands are expensive. If you have limited costs, you can choose managed switches from other reliable firms. All in all, cost-effective product is a better choice. The best network switch is the one that suits your network most. When you buying a managed switch for home, remember to consider the factors mentioned above. 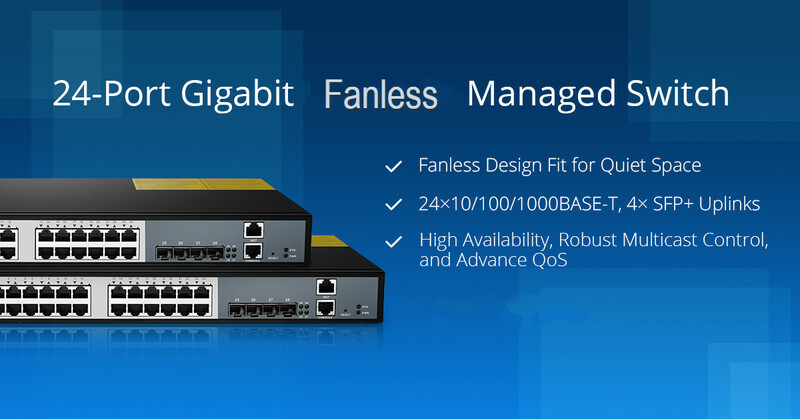 FS provides various managed switches with high-quality and high performance. If you have any needs, welcome to visit FS.COM.